mommy's reviews: Try Shutterfly For Your Christmas Cards This Year! 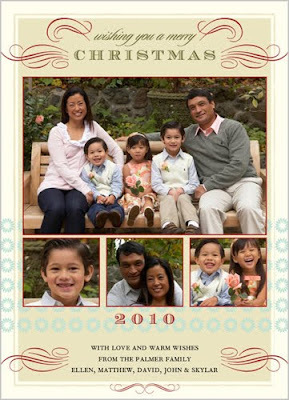 Try Shutterfly For Your Christmas Cards This Year! I cannot believe that I am talking about Christmas!!! Where has this year gone? I have recently become acquainted with Shutterfly through a friend's blog and really LOVE what they have to offer. Shutterfly is a place where you can turn your most treasured photos into memories, keepsakes, and cards. There are so many options when it comes to choosing the product that fits you best. For instance, if you are looking for a calendar, they have desk calendars, wall calendars, and calendar posters. 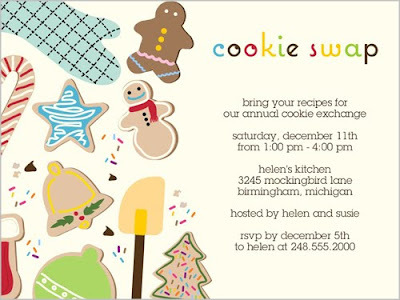 Or, if you are throwing a Holiday party and need some very unique, personalized invites~Shutterfly has you covered there too with their complete line of Holiday Invitations! Personally, I am in love with their Christmas Photo Cards. What a GREAT idea! I have two small children that are growing by leaps and bounds, and alot of family don't get to see them often...it would really be great to have their picture on a festive Christmas card with a greeting from our family. Hey, you get it all in one! A picture, a beautiful card and a warm greeting for the season. Could it get any better? Well, actually, yes. The selection of Christmas Photo Cards is endless...over 700 choices! Can you imagine the possibilities? My personal favorite is the In His Name Religious Christmas Card...I love all the names of God that are listed. Another favorite is the Vintage Glee Christmas Card ~ there is plenty of room for a picture of Hannah and Jacob separately, then together, then a family shot. I also like the design as it looks very elegant. I am not a fan of saying "Happy Holidays" so I love how it says "Merry Christmas"! (I AM a fan of keeping Christ in Christmas!) That is probably the card design I would go for. 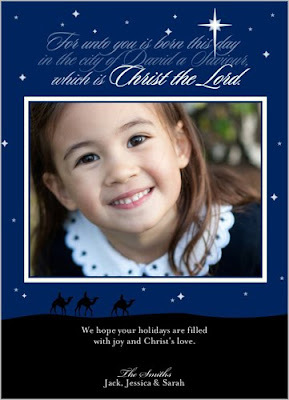 So, when deciding where to go to get your Christmas cards, I would HIGHLY recommend Shutterfly as your source. With so many options, colors, designs and layouts--your creativity can really come alive! Happy Shopping!!! Hi! Thanks for following me @ The Thrifty Military Wife blog. I am now following you as well. I look forward to reading. Hi! Thanks for stopping by & following. I am your newest follower!